People are slowly realizing the lucrative nature of the web and graphic design industry and therefore, there is a sudden demand for good quality, professional graphic designers to cater to the various designing needs of the people. 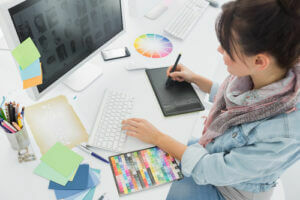 There are excellent career opportunities in store for a graphic designer. To be successful, you need not limit yourself to working in large design studios. You can take up projects on a freelance basis as well. Graphic designing not only offers excellent compensation but also makes sure that you let your creative take the forefront and come up with interesting designs. However, with the momentum that this industry is gaining, you need to be competitive enough to keep up with the pace of its changing trends. Besides, you also need to ensure that your creativity does not hit a roadblock as monotony can single-handedly take you down. Given below are some tips that will ensure that you have a fulfilling career in the field of graphic deisgning. You may be extremely passionate about graphic designing however; you need to realize that unless you study graphic designing professionally, your skills will be raw. It is only through a formal education that you get the opportunity to refine your skills. Some people however, strongly oppose this idea and believe that one can come up with an excellent portfolio and work as a freelancer if they wish to. Although this fact cannot be denied, it is always a better option to get a formal education in graphic designing. To know more visit the following website. Packaging design and many more. However, this does not mean that you focus all your energies towards just one specific area. While it is good to have specialised knowledge, it is also important that you strive to learn about developments in the other areas of graphic design as well. If you look thoroughly through the internet, you will come across a plethora of design forums and communities that involve a host of designers talking about the latest developments and solving each others’ issues. These communities are therefore, an excellent way to keep up with the trends in graphic design. Besides, it can provide you a platform to express your creativity and get an honest response for the same. If you cater only to specialised graphic designing, then you must find a community that shares similar interests. You may not realize it but you need to constantly discover new places to get a good amount of inspiration. If you confine yourself to the four walls of your home or office cubicle, you are limiting your creativity. Conversely, if you visit new cities and countries, you get an opportunity to familiarise yourself with their cultures and traditions. Besides, clicking random photographs while traveling will help trigger new and fresh design ideas that will help breathe life into monotonous and stodgy designs. You will be surprised at the ideas that will flock your mind by doing this very simple exercise. Graphic designing aims at constantly pushing you to your limits to bring out the best in you. If you wish to be a successful graphic designer, you must have an upper hand on sketching and drawing. It is only through this process can you go a step further and use professionally designed software for further designing of the website or logo. To ensure that you do not lag behind, you can always learn from online tutorials that have the ability and the power to inject new ideas into your mind. For instance, Coursera is an excellent free platform wherein you can learn the techniques involved in sketching and painting over a given span of time and on completion of this course, you are also awarded a certificate of excellence. There are also online training courses that guarantee excellence on completion. The best part about learning these online courses and tutorials is the fact that they are absolutely free of cost. Author bio: Douglas Ralston is Entrepreneur and Technology Professional in the Web Mobile and Application Marketplace.